About 65 % of all people who are visually impaired are aged 50 and older, while this age group comprises only 20% of the world's population...Increasing elderly populations in many countries mean that more people will be at risk of age-related visual impairment. So yours truly was at Focus Point Sunway Pyramid branch where Focus Point recently launched their “Stronger Together For Universal Eye Health” – a fresh, unique and colorful twist to promote and support eye and vision care amidst rising vision impairment and eye problem incidences in Malaysia. 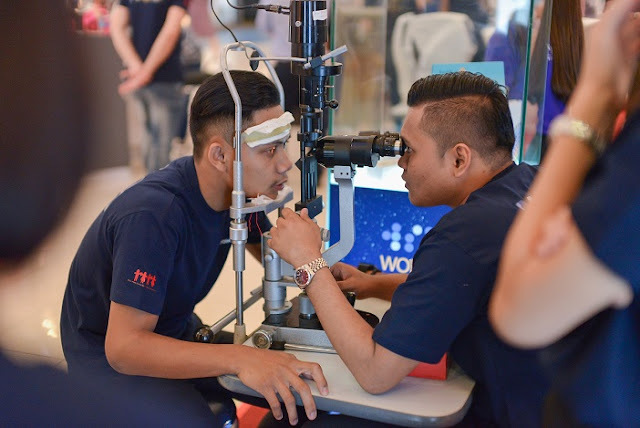 It is said that 54% out of every 1,000 Malaysians suffer from low-vision impairment owing to health defects as revealed by the Health Ministry’s National Optometry Services head Dr Nur Zahirah Husain. Dato Liaw Choon Liang, CEO of Focus Point said the company is committed to aiding the cause of eye and vision care on World Sight Day annually. “It’s the company’s philosophy to give back - which is why the company has started the Focus Point Caring Heart Charity Foundation with the motto "Caring Hearts – Together We Make A Difference" many years ago. “World Sight Day, as our key CSR initiative under this Foundation, is particularly meaningful and close to our hearts as it’s directly related to our business of eye wear/care. It is natural for us to conduct any form of awareness, education and contributive activities to support vision care cause;” said Dato’ Liaw. This year’s World Sight Day (WSD) theme is “Stronger Together” dovetails the company’s CSR vision of “Togetherness”. Promoting eye care is not a solo effort and it is important that everyone plays a part, from eye care professionals like ophthalmologists, optometrists, nurses, donors, patients, carers, to the wider family. The Creatif Academy of Global Art was invited to help bring the theme “Universal Eye Health” to life by illustrating the importance of eye care on a global level. More than 10 Creatif Academy students displayed hand-drawn art pieces of national flags to depict the Universal Eye Health theme. They were then joined by Dato’ Liaw to complete a painting of a globe within an eye to symbolise the launch. The students also shared their insights on vision care amongst youngsters today amidst increasing vision problems amongst young Malaysians today. They received complimentary eye screenings and sun glasses from Focus Point. Focus Point’s Senior Manager Professional Services, with more than 17 years in the eye care industry, Mr Poo Guan Meng presented most “popular” eye issues according to different ages) nutrition tips, and practical ways to take care of one’s eyes daily. The beautiful Elizabeth Tan, music and social media sensation, was also at the event to share her experience having lazy eyes and also her thoughts about vision care and how excelling in what you do and in life all start with a good vision, which in turn leads to a good life. Focus Point provided free eye checks with various high tech machines which can detect sophisticated eye problems for the general public and for every pair of eye wear purchased in the month of October Focus Point will also be giving a pair of eye wear to the needy. How cool right!! 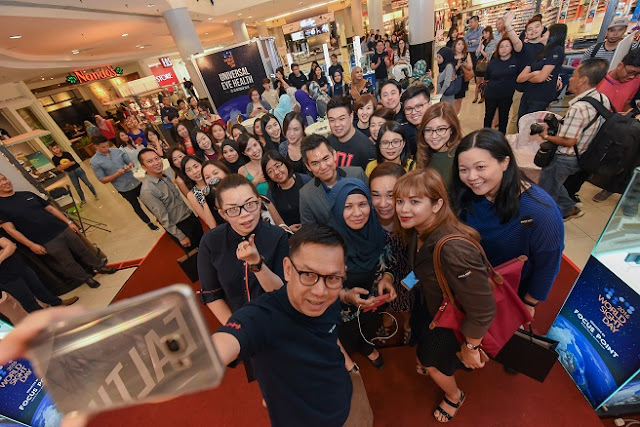 The media event concluded with Dato’ Liaw leading all guests in a ‘Carefie‘ photo session – a new term coined today to reflect taking a group photo “because one cares”. 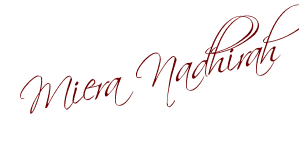 The objective is to create a viral social media effect to spread the positive key messages of vision care globally. This is such a beneficial event for everyone. I'm also experiencing low vision as I'm actually getting into my eyeglasses. Truly our eyes is such a valued gift that we should always treasure and take good care. I agree with you that vision problems can be avoidable and treated right away. It is sad that people from low income bracket do not have the means to take care of their eyes. I think that there are free check-ups and eyeglasses here in the Philippines but I know these services are limited only.